This lab manual is heavily focused on silicon-based components, such as diodes and bipolar junction transistors. In each lab, after a review of theory, students will simulate circuits to learn about each component's behaviors, characteristics, and applications. Then they will build electronic circuits to further validate and analyze the behavior. At the end of each lab, students complete long answer questions to evaluate their overall understanding of the concepts. Given a common type or configuration of diodes, transistors or thyristors, students will be able to explain its operation, characteristics, and application, and analyze and validate its behavior using simulation and instrumentation. 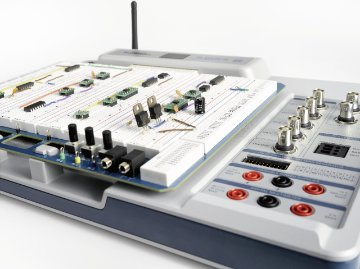 Given a specification, students will be able to design an open loop, follower, non-inverting, inverting, or instrumentation amplifier to meet the specification, and test its behavior using simulation and instrumentation. Given an analog circuit application such as a power supply, students will be able to discuss how common analog components can be applied. In this lab students will examine a diode's main characteristics and functions, as well as some of its notable uses in the real world. First, students learn about the fundamental behavior of diodes by simulating a circuit in Multisim Live. Then they confirm that behavior by building a circuit and measuring the current through a diode. Throughout this process they will also be answering multiple short answer questions to confirm their understanding. Then, students will use and examine the behavior of diodes in application circuits, including a clipper circuit and a half-wave rectifier. In this lab, students will learn about the applications of diodes in rectifiers and examine the components and operations of a full-wave rectifier. First, students will learn theory about a diode's role in a rectifier and complete several short answer questions to confirm their understanding. 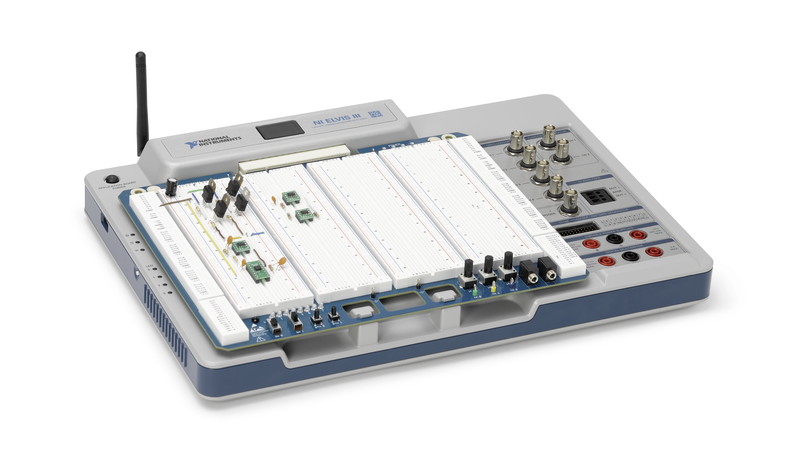 Then students will use Multisim Live to simulate a rectifier in a circuit and test their finding by implementing a full-wave rectifier on a breadboard. Finally, students will explore the use of filter circuits in rectifiers using an oscilloscope, all the while documenting their results. In this lab, students will focus on Zener diodes, including their theory of operation, applications, and uses. They will first observe the function of a zener diode when used as a voltage regulator in circuit simulation. Then they will implement and test the circuits using the NI ELVIS III breadboard and IV Analyzer by appling voltage to a load through a zener diode. Students will lastly be asked to explain the concept and applications of Zener diodes in short answer questions. In this lab, students will be looking at some of the important applications of transistors in the real world, discussing why they are important, why we use them, and what they can do. A transistor, similar to a faucet, can control the flow of electrical current. In section 1 of this lab, students will look at the definition and the importance of a transistor and understand its behavior by simulation using Multisim Live. In section 2, students will learn how bipolar junction transistors are used as a switch. They will use actual breadboarding and circuit-building to confirm the theory and simulation. In this lab, students will examine the implementation of amplifiers using transistors and identify the important characteristics and applications of a transistor amplifier. In each section of this two part lab, students will investigate the behaviors of different transistor amplifier configurations through simulation and hands-on bread boarding, plus short answer questions to confirm their understanding. In this lab, students will be looking at Metal-Oxide-Semiconductor Field-Effect Transistors (MOSFETs), their operation, and applications in real-world examples and hands-on experiments. First, students will explore the definition and theory of a MOSFET and its functions. Then, students will examine MOSFETs and their importance in circuitry via simulation followed by application on a bread board. In this lab, students will be observing the operation and characteristics of thyristors. First, students will learn the theory of a thyristor. Then they will focus on seeing a thrysistor in simulation, followed by building one on a bread board, measuring data with an oscilloscope. Finally, students will explore a special type of thyristor called a TRIAC through simulation and answering short questions. In this lab, students will be looking at two devices used as electronic switches: optocouplers and insulated-gate bipolar transistors (IGBTs). First, students will investigate the theory and behavior of optocouplers. Students will use optocouplers digitally and in a real circuit to control a high power loop from a low power loop. Students will also learn about IGBTs. First, students will look at detailed theory of optocouplers and IGBTs. They will then explore the importance of both electric devices. Finally, students will examine specific uses of optocouplers and IGBTs in real-world examples and answer short answer questions. In this lab, students will be looking at the open-loop behavior and theory of an operational amplifier (op-amp). First, students will learn a about an op-amp in a short informative video. Then they will be able to learn from hands-on application of op-amps through circuit simulation and circuit building on a bread board. Finally, students will examine why op-amps are important and how they can use them in real-life situations. In the previous lab, students examined the closed-loop behavior of an op-amp. In this lab, students will be measuring the response of an op-amp commonly used in closed-loop configurations. 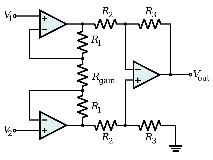 In these configurations, op-amps are used to amplify an input signal. First, students will look at a detailed definition of op-amp circuits and a web-based circuit simulation. Then, students will explore what op-amp circuits do and their importance through hands-on circuit building. Finally, students will examine how and why we use op-amp circuits. In this lab, students will be looking at a configuration of op-amp amplifiers called instrumentation amplifiers. First, students will look at a detailed definition and a web-based circuit simulation of an instrumentation amplifier circuit . Then, students will explore what instrumentation amplifier circuits do and why they are important in hands-on circuit building. Finally, students will examine how to use instrumentation amplifier circuits. In this lab, students will be building their own DC power supplies through three important steps: rectifying, filtering, and regulating. Students will be using circuit components and applying major concepts learned throughout this course. They will be implementing these circuits on a real bread board, using the tools they have learned in the course, and applying their knowledge directly to circuit building. In this lab, students will design and build a voltage level indicator, applying the knowledge they have learned from earlier labs into a hands-on application. 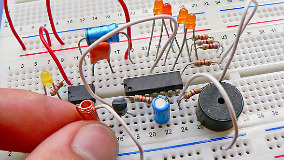 This very practical circuit uses a voltage divider and op-amp comparator network to light up a number of LEDs depending how much voltage is provided by a source under test. Students will design and test their circuits in Multisim Live, then build them using the NI ELVIS III. In this lab, students will design an Electrocardiogram (ECG) circuit using Multisim Live, and then build and validate the circuit to produce the most accurate possible heartbeat reading. Students will consider the noise and bias a heart beat signal is subject to when measured with common leads. Using real data, students will design signal conditioning circuitry to amplify and filter the signal to meet a certain requirement. Note: Some labs require premium access, which is available through a Multisim Desktop active license.